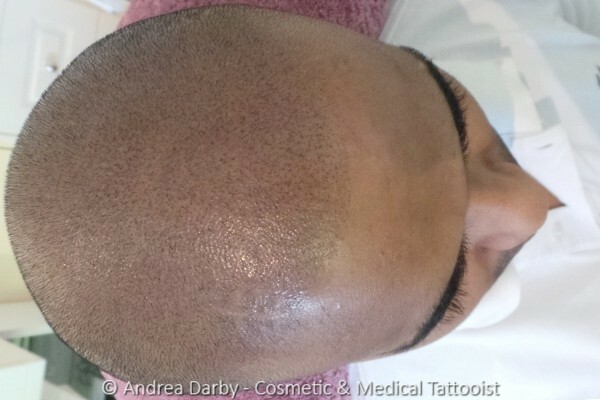 This client in his early thirties had not had any prior hair transplant surgery and had previously explored all other hair restoration options, a new SMP hairline was selected based upon the age of the client and residual sparse hair pattern. 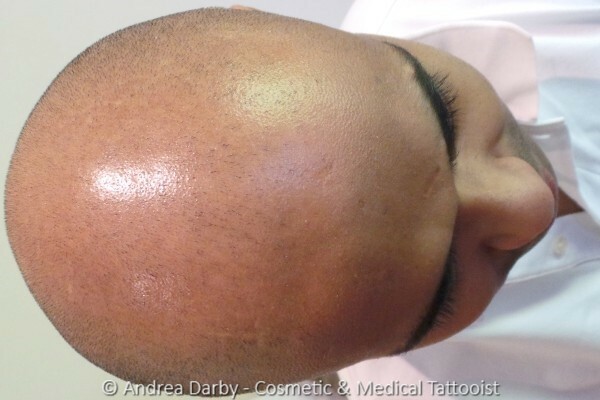 Quite a wide variation in hair follicle diameter was discovered after conducting a trichogram therefore a complimentary sizing was matched during Scalp Hair Follicle Simulation Tattooing™ to provide a random size pattern that matched natural hair distribution on associated regions of the scalp, the client had a small pre-existing scar on the right hand side of the frontal scalp following a small surgical procedure and we discussed the pros and cons of camouflaging the scar with tattooing. Comments: Collagen Induction Therapy (CIT) is an optional service to increase natural skin colour within scar tissue donor sites following Follicular Unit Strip Surgery FUSS or Punch Grafts, CIT is sometimes performed at the choice of the client prior to Hair Follicle Simulation Tattooing in an attempt to stimulate the production of melanin in scars that are pale in colour in comparison to the surrounding skin colour. 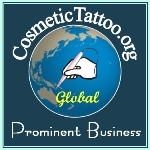 Scars can also be peppered with random tattoo pointillism's or pigment mosaic to help camouflage the scar and blend back into the surrounding scalp. However in this particular clients case the client and I decided together that the pre-existing small scar on the right hand side near his new frontal SMP hairline actually improved the overall natural appearance of his new SMP hairline by providing a random feature on the scalp, many of our regular clients tell us that they are often able to detect SMP work performed on others elsewhere due to excessive uniformity, overly hard hair lines, hairlines that are too angular or too far forward and an overall lack of randomness in the finished result. We see a lot of examples of unnatural looking SMP frontal hair lines and hair lines that are brought too far forward relative to the age of the client this can result in the clients SMP work becoming far more noticeable to others, often this is due to lack of guidance on SMP hairline design during training programs and as a consequence a lack of guidance to the clients on their new SMP hair lines, our SHFST Course covers this topic to assist Scalp Tattooing technicians to provide more natural looking SMP hairlines for their clients which are more difficult for others to detect. We have always taken a science based approach to client services. Multi-Spectral examination is a routine part of our initial follow up appointment which provides a more precise indication of the exact needle depth for the individual client and is used in conjunction with our own proprietary analysis software which also provides guidance on the best needle type relative to the individual client hair follicle sizes and distribution. CT-AIVEP Training - Scalp Hair Follicle Simulation Tattooing (SHFST™) - Module 16. SHFST Tricho Analyser - Software access is provided to SHFST students and graduates. However for some highly specialised procedures such as was required for this client more advanced equipment such as the Amiea Sense is required for the best possible outcome. The SensiDrive was utilised to minimise the risk of triggering Post Inflammatory Hyperpigmentation which can result in pigmentary halos around SMP pointillism's due to tissue trauma to the skin during tattooing as can occur with standard equipment particularly with Fitzpatrick skin types IV-VI and the Amiea Sense also has the advantage of being able to use some specialised needle profiles for other procedures that are not currently available for some the other devices. The Amiea Cool Spot is the ideal piece of equipment to cool skin to precisely the right temperature to minimise swelling and control pain and bleeding, because of the precise temperature control Cool Spot is superior to any other form of skin cooling such as cold packs or older style Cryo units. Cool Spot can be used as a stand alone unit or as an accessory plug in for the Amiea Sense machine, cool spot is particularly useful for Scalp Tattooing services as it can significantly reduce the need for other forms of analgesia and is useful for controlling bleeding. For the vast majority of Cosmetic Tattoo procedures I advise against mixing pigment colours together as there is a risk of creating a 'mud mix' this is a muddy brown/blue/grey colour that can result from mixing colours unnecessarily, however for some specialised procedures such as this particular case the blending or layering of pigment of colours is required for an optimal result. Specialised needle techniques were utilised for this service which are described in detail during our Scalp Hair Follicle Simulation Tattooing (SHFST™) training course. "We are interested in adding this service in our clinic and would like to know more about your course and if you are prepared to train our staff in China, please contact me to discuss further." "I thoroughly enjoy reading the info in your case studies, thank you very much for taking the time to do this please keep them coming.